Welcome to the August 2016, edition of the Hillsborough Street Renewal, a monthly e-newsletter keeping businesses and residents along the corridor up to date on construction news. This past weekend NC State welcomed students as they moved into area dorms and apartments in anticipation of classes starting on August 17. The vehicular traffic flow on Hillsborough Street is high, but now that classes are back in session, there is also an influx of pedestrians and cyclists along the corridor from the new and returning students, making the street even more busy. With the student population increasing it is important to reiterate some basic safety precautions that will help keep everyone safe in the construction zone. It is imperative to follow pedestrian and vehicular detours and not cut through the barricades. 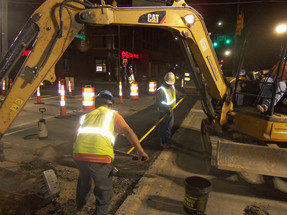 The Hillsborough Street Project has a lot of activity going on at all times of the day and night and so staying alert to your surroundings and paying attention in the work zone is important at all times. Cycling through any active work zone can be difficult. The lanes on Hillsborough Street are narrow, and with construction fencing and barriers, there is not enough room for cars to safely pass cyclists. 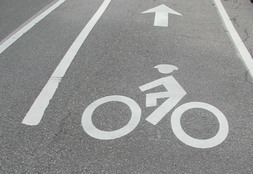 For this reason, it is recommended that cyclists that feel comfortable doing so should ride in the center of the travel lane during construction when riding through the work zone. Other cyclists may wish to consider using Clark Avenue/Everett Street as an alternate route to Hillsborough Street during the construction of the project. 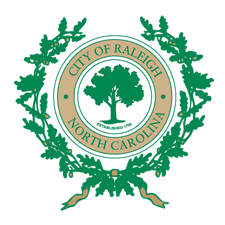 For the latest construction traffic information check the Travel Updates section of our Hillsborough Street Renewal Project website. You can also stay up to date on what construction crews are working on by checking the weekly schedule, weekly updates and our travel updates. 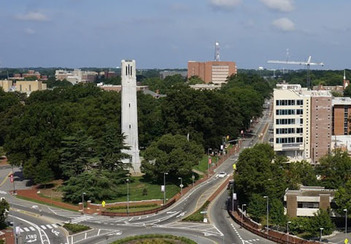 On the fun side of things, the City is joining the Wolfpack Welcome Week celebration by having members of our team at Packapalooza again this year. We will be at Packapalooza on Saturday, August 20, 2016, from 2-5. So, say hi and get a glimpse of what Hillsborough Street will look like once the project is complete and sign up for a chance to win a free lunch. On Tuesday, August 9, 2016, the City held its first Hillsborough Street Renewal Project, Phase II Coffee Talk. The event took place at Cup A Joe with the City Project Manager, Richard Dickie and the contractor's Project Manager, Mason Kenyon on hand to answer questions and give updates on construction progress along the corridor. Coffee talks are monthly informal public meetings coordinated by the City of Raleigh, offering businesses and residents affected by construction an opportunity to talk with the project manager, get updates on progress along the corridor and ask questions regarding construction along the corridor. The next Coffee Talk is scheduled for September 13, 2016. The location will be announced later this month, so stay tuned. There has been a lot of activity along Hillsborough Street this past month. Contractors have had pretty good weather and things are moving along. Currently, contractors are working on the underground infrastructure along the corridor installing new water and sewer lines and the duct bank that will take many of the overhead lines underground. During nighttime hours, new manholes were installed, and a sanitary sewer line was run from the Dixie Trail intersection to the Bagwell Street intersection. During daytime hours crews were also installing a new sewer line from Gardner Street to Brooks Avenue and new a water line was installed from Gardner Street to just east of Friendly Drive. The utility duct bank has been installed from Dan Allen Drive to Dixie Trail and a new 10’ x 10’ electric manhole was installed at Brooks Avenue. The private utility companies have also started to work along the corridor. PSNC has installed a new gas line from the private drive across from Bagwell Avenue to Dan Allen Drive. Duke Energy Progress was out on the weekend of Saturday, August 6 and Sunday, August 7. They started underground exploration in preparation for transmission pole relocations. 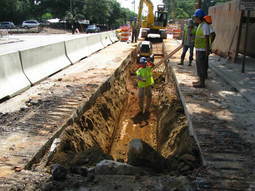 This work required them to shut down the westbound lane of traffic on Hillsborough Street. Visit the website for weekly updates. The new underground infrastructure will continue being installed along the corridor during the next month. Last week contractors worked at the Friendly Drive intersection, installing the new sewer line. This week the nighttime crew will start work on storm drain between Daisy Street and Dixie Trail, in front of Stanhope. 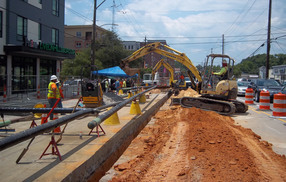 Daytime crews will continue installing water lines on the south side of Hillsborough Street from Dixie Trail to Concord Street and sewer line from Concord Street running west towards Rosemary Street. PSNC will finish the installation of the new gas line on the west side of Dan Allen Drive starting Monday, August 15, and continue throughout the week. This work requires that they close the right turn lane from Dan Allen Drive. PSNC will have flaggers on hand to direct traffic while the lane closure is in place. Duke Energy Progress will be returning on Saturday, August 27, and Sunday, August 28, to resume their foundation explorations for the transmission pole relocation work. Once again a detour will be in place for westbound traffic from Brooks Avenue to Shepherd Street and detour the traffic via Brooks Avenue to Wade Avenue to Faircloth Street during the time they are working.